• Why am I experiencing blocks in my life? • Why does it take so long for me to find a partner? • Abraham told me that the concept of everything already existing is a false premise, could you comment? • Could you comment on Abraham’s teaching of the Universe being about inclusion not exclusion? • If something I desire is not coming to fruition, does it mean I should examine my belief system? • Could you tell me more about the ET contact I’ve had in my meditations? • How can I control my emotions from going up and down? • Can you help me understand the concept of simultaneity? • How can I make more of an impact spiritually? • What does synchronicity in terms of numbers mean? • Is there individuated consciousness in All That Is? • Is is possible to lose the fear of death while in the physical body? • Does your race seek a relationship with God? • Could you comment on our shared reality? • Who built the pyramids? Bashar discusses the dark ages and asteroidal impacts. • What is the best way to raise our vibration? • Does positive and negative exist in the higher dimensions? • Will I be able to explore other planets after I die? • Is there a crystal we can use to contact you? • What is your opinion on DMT and other psychedelics placed here on Earth? • Are the 23 Bloodlines coming to a close soon? • Could you elaborate on the Sirius star system and our emotional streams? 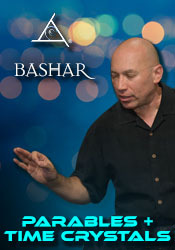 Bashar discusses dolphins and whales and their relationship to Sirius. • Could you speak on The Fool archetype? • What is the reason for the recent mass strandings of pilot whales? • How can I overcome my reluctance to become known? • Are there any first contact specialists here on Earth? • What exactly is meant by the structure of existence? • Who decides what I need? Bashar speaks on the seven neutral needs. • If everything is symbolic anyway, what is the difference between a screen memory and something that actually happened? • What is the difference between the energy that is being channeled by Bashar and Abraham?